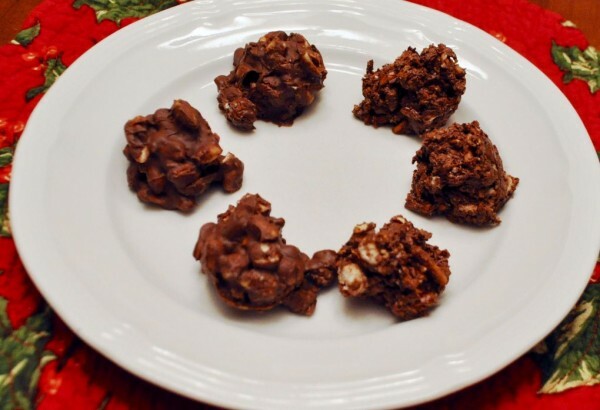 On Saturday a friend, who clearly thought it would be fun throw a little temptation my way, sent me a picture of the peanut clusters he’d just made. I showed the picture to John who said, “I bet those would be great with marshmallows in them.” (He’s a sucker for anything with marshmallows and chocolate together.) So, I decided to look on Pinterest for some inspiration for what is basically Rocky Road candy with peanuts instead of walnuts. I found a recipe that called for chocolate chips, butterscotch chips, mini marshmallows, and peanuts. With that recipe in mind I headed to the grocery store for the ingredients. Thus, I made my way home with the ingredients for my new creation, Chocolate Caramel Rocky Road. And, before I decided to share my new taste treat with you I made the grand sacrifice of eating two of them just to be sure I was sharing a good recipe. If you happen to be going to a cookie exchange in the next couple of weeks, these would be perfect. They’re quick and easy to make but every bit as good as one of those cut-out sugar cookies that are so time consuming. Put chocolate and caramel chips into a 4-cup measuring bowl or similarly sized microwave safe bowl. Cook on high in 30-second increments, stirring after each one until melted. Add in marshmallows and peanuts. Store in an airtight container, preferably in the refrigerator. Variations: You can also use crushed pretzels in place of the peanuts (you’d still want to leave out the pumpkin seeds, however.) In the picture with this article the peanut rocky road clusters are on the left and the pretzel rocky road clusters are on the right. I let John try one of my creations last night. When I asked him if he thought they tasted okay, he said, “They’re good, but I’d leave out some of the peanuts and add more marshmallows. So, if you’re a sucker for marshmallows, like my husband, feel free to adjust accordingly. This entry was posted in Food Glorious Food and tagged candy, caramel, chocolate, rocky road on December 4, 2017 by Nancy. Yummy! I have one ingredient of the four . ???? Oh well -TIA -(this is Africa after all)! Maybe another year . ??????? ?